Sun exposure, skin aging and genetic factors are the main causes of the change of tone and intensity of the pigmentation of the skin, which can lead to undesirable skin effects. Ultimate W + Whitening Mouthwash - drinkable nutricosmetic that lightens and unifies skin tone from its interior, diminishing the appearance of dark spots. Its effectiveness is achieved by the inhibition of tyrosinase and the a-MSH, involved in the process of melanin synthesis. Gallic Acid and lipoic acid, active ingredients which inhibit the activity and synthesis of tyrosinase, the enzyme responsible for the formation of melanin. Can be taken alone or as a complement of the local application care Ultimate W + Mesoestetic. 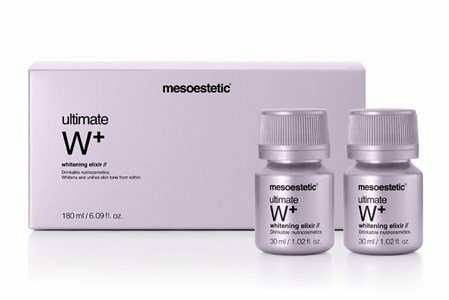 Mesoestetic developed a whitening treatment and skin enhancer, which mitigates and prevents the appearance of dark spots and small wrinkles, providing great lightness and softness to the skin: Mesoestetic Ultimate W +. Whitening and radiance: inhibits the involved enzyme in the synthesis of melanin, while it stimulates cell renewal, removing accumulated melanin. Anti-aging and moisturizing: promotes the skin's natural barrier, minimizing pore size and reducing fine lines and wrinkles. Prevention and protection: powerful antioxidant, which protects from UV rays and pollution. 1 vial a day preferably at night, during the first six days of each month for three months. Each pack contains 6 bottles of 30 ml each.